As skilled as you may be with remodeling, carpentry, decorating, or home improvement work, chances are that you will run into a project where you need assistance. It’s why a number of homeowners choose to hire an experienced handyman. But because the majority of handymen aren’t necessarily electricians, plumbers, or carpenters, how do you go about finding the one that’s right for you? Our last blog post explained how to tell if it’s time to hire a handyman. 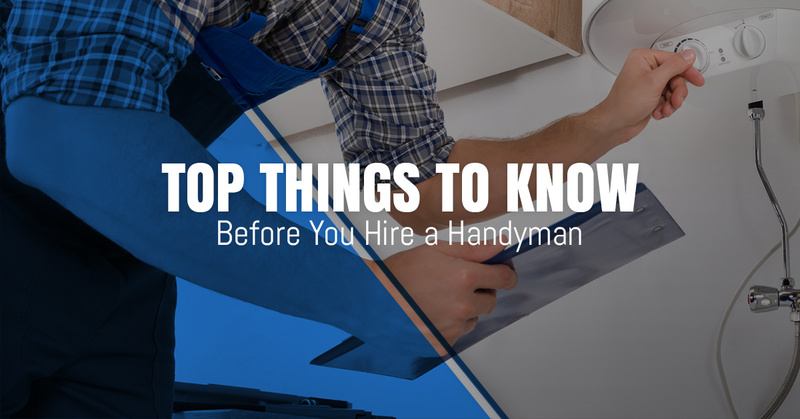 This one, however, will go into detail of what you should know before lining up a handyman. Come up with a list of what needs to be accomplished – It’s best to figure out what exactly you want your home handyman to do. If you’re upfront with the project right from the beginning, things should go much smoother. From kitchen and bathroom remodels to painting and drywall projects, Matt has handled it all for more than 20 years. Matt can tackle general handyman work, repeat maintenance, larger scale home remodels, as well as carpentry and painting. Make sure they have references – If you’re taking the time to find a handyman, you don’t want to cut corners. After all, this person is likely going to spend several hours in your home. Matt has relied on word of mouth referrals through the years and now has plenty of customer testimonials that you can see here. A bonded, licensed, and insured handyman is a must – You don’t want just anyone coming into your home and providing their own “handyman service.” That’s why Matt recommends that customers shop around and be picky. Rest assured that Matt is covered in nearly all situations with general liability insurance. MC Services also carries workers compensation coverage for larger jobs. Request cost estimates for materials and labor ahead of time – Ideally, an estimate for local handyman services should be within 10 percent of the actual project cost. Previous customers have raved about Matt because he not only provides fair prices but also stays available until a job is finalized to a client’s liking. Homeowners will appreciate that Matt runs such an ethical handyman home repair business and goes the extra mile when it comes to your home improvement needs. Create a schedule for the work to be done – Now that you’ve got the tasks, references, and cost squared away, the next step is determining a timeframe for everything to be completed. Keep in mind that the schedule should go hand in hand with the written contract. A detailed schedule along with a contract ensures there will be no confusion, communication, or forgotten details between you or the handyman. The bottom line is that if you’re in need of an experienced remodeler or handyman, you want someone reliable who can provide professional work with just about any home improvement task. But you also want to be sure that your handyman home repair specialist will communicate well and provide the utmost customer service. Get your home back in tip-top shape with Matt of MC Home Services. Contact us today.